Thekua(the vrat recipe of chhath puja festival) is the most famous dish of the festival that is prepared with wheat flour, ghee, sugar and dry fruits. A tight dough of the above ingredients is prepared which is further shaped into small/medium tikkis and deep fried in pure ghee. Make a watery solution by mixing jaggery, water, and green cardamom. Add 4 tbsp ghee to the jaggery syrup prepared above and mix it to wheat flour, along with coconut and make dough of it. 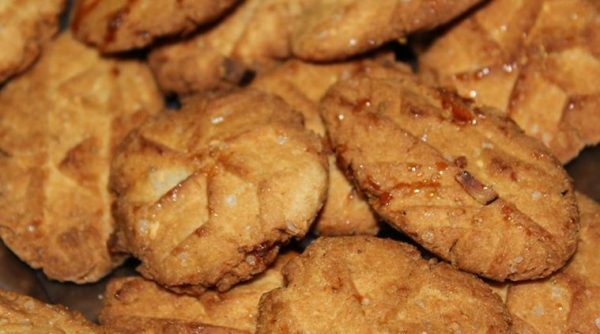 Remember to use the exact quantity of jaggery syrup to make dough. Take a piece of dough, press it flat against your palm and then press it on a saancha for making thekua. Once the thekua has acquired the imprint from the saancha, deep fry it in ghee till it gets reddish brown. Filter out the ghee and put them aside. Allow the thekuas to cool down and serve.